Recently I’ve been pondering reading well, and how one goes about reading a book carefully and with discernment. There’s no better place to start applying these thoughts than with Farenheit 451 by Ray Bradbury. Besides, after I read Corey’s review I knew that it was only a matter of time before I actually picked this up and read it. The premise alone is fascinating: a world where books have been banned, and firemen burn books and start fires, instead of putting them out. Enter Guy Montag, a fireman whose life is turned inside out when a teenage girl shows him the sort of knowledge that books have to offer. Because of this, Guy does the unthinkable: he reads the very books he’s supposed to be burning. But that would just nibble the edges. The whole culture’s shot through. The skeleton needs melting and reshaping. Good God, it isn’t as simple as just picking up a book you laid down half a century ago. Remember, the firemen are rarely necessary. The public itself stopped reading of its own accord. You firemen provide a curcius now and then at which buildings are set off and crowds gather for the pretty blaze, but it’s a small sideshow indeed, and hardly necessary to keep things in line. So few want to be rebels anymore. And this is just one of the topics touched on in the book. Summarizing the story is deceptively easy — the message, on the other hand, is less easily done. Censorship is merely the most obvious of a long list: moral absolutes, suicide, true happiness, loss of literacy, and entertainment, among other themes. But again it all boils down to the root; just as the censorship is self-inflicted, so is everything else. This is a book of man’s depravity. Very heavy stuff. From a writing standpoint, the book is phenomenal. The invasive seashell radios and television walls perfectly capture just how technology has weaseled itself into our lives. Now, with Facebook and smartphones and such, the warning is even more vivid. Bradbury’s careful choice of words leap off the page toward you. This book is so good that if such a form of book-buring censorship existed in the world, Farenheit 451 itself would certainly be burnt. The characters are equally gripping. Complex supporting characters such as the fire chief, Guy’s wife Millie, Clarisse McLellan, and Faber, lend an incredible amount of layers to this book. Rather than just a clear-cut good and evil confrontation in this book, we get grey characters like Millie and the fire chief. Figuring out the stories of the supporting cast is almost as interesting and entertaining as figuring out Guy’s story. 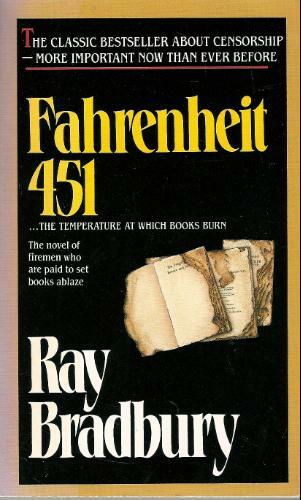 In short, you can’t go wrong reading Farenheit 451 by Ray Bradbury. It’s a classic, with extremely deep content that will leave you thinking and pondering far after you’ve closed the back cover. I really enjoyed that book. I was very gripping as you say. Excellent review. I’m glad you enjoyed the book – it’s brilliant, is it not? 🙂 It’s my second favorite book of all time, and one of the reasons I love Bradbury’s storytelling so much. 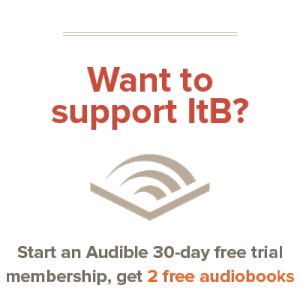 It is very brilliant – thanks for drawing my attention to it!